The braid can be high or low on the crown. The Greek braid hairstyle is a seemingly complex look in which one or more braids are wrapped around the head like a circlet. As with other braided hairdos, medium or long hair is required. However, hair texture and curliness is irrelevant. 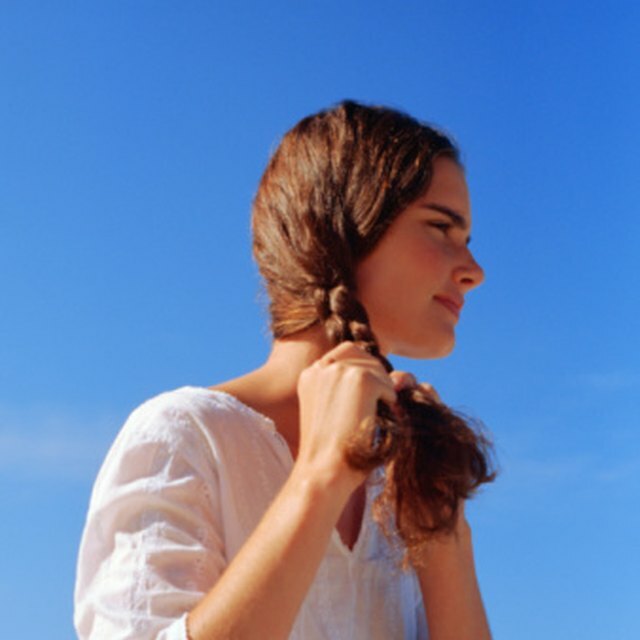 Curly, wavy or straight -- anyone can wear a Greek braid. You can make the Greek braid in one of two ways: the braid is made on one side and wrapped around, or the braid is fixed from one side to the other, like a French braid. Wash and condition the hair. Brush in any leave-in products while the hair is wet. Do not use excessive force. Remove knots from the ends of the hair first. Part the hair across the crown from ear to ear at the point where you want the braid to lay. Continue to part the hair from the highest point of this division down the middle of the crown following the bridge of the nose. There will now be three sections of hair: two on either side of the face and one larger section in the back. Gather the back section into an alligator clip or ponytail holder. Braid the two front sections. Split the left portion of hair into three strands. Cross the rightmost strand over the center strand so that it lies to the right side of the leftmost strand. Cross the leftmost strand over the center strand and pull all three strands to the side to tighten the weave. Repeat until the entire section is braided, and then do the same for the hair on the other side. Bend both braids up towards the top of your head forming a circlet. Pin the hair in place. Tuck the ends of the left braid under the body of the right braid and vice versa. Part the hair across the top of the crown in a straight line, from ear to ear. Gather the rear section of hair into a ponytail holder or clip. Brush all of the hair in front of the part to the side of your face with a smaller or less vibrant eye. Gather three strands of hair from near the roots, at the end opposite the loose ends. Lift up approximately three-quarters of the hair in that area. Cross the rightmost strand over the center strand, then cross the leftmost strand over the strand to its immediate right, which was previously the rightmost strand. Repeat. Add hair to each strand, increasing the size of each strand. Repeat Steps 5 and 6, progressing horizontally across the crown towards the opposing ear. Pin the end of the braid in place or continue until there is no hair to pick up, then progress into a loose braid; the loose braid can then be wrapped and pinned across the first braid for a thicker style. Modify the look of the Greek braid by adding ribbon and clips, or by altering the thickness of the braid itself.